For the eager acoustic musician, it's important to choose the right amplifier to accurately translate your sound. The Fender Acoustasonic 40 is built to replicate a vintage appearance but a sound that suits a plethora of modern guitar players. The Acoustasonic 40 provides room-filling audio at an incredibly low price. The Fender Acoustasonic 40 is built with two channels rather than just one, which opens up even more usability. 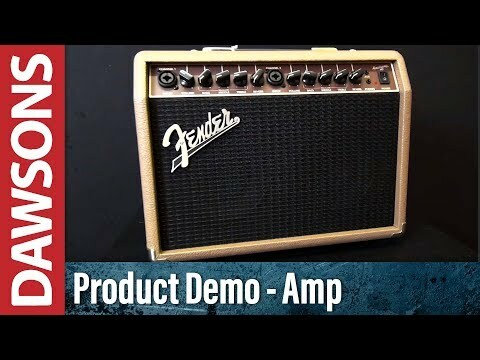 By employing two amp channels this allows both guitarists and singers to take full advantage of the amplifier's onboard features. Thus, whether you perform solo or as part of a duo, the Acoustasonic 40 is the perfect accompaniment. Each channel has an XLR and 1/4 inch input allowing you to plug in a microphone and your instrument simultaneously. The amp features two 6.5 inch Special Design full-range speakers which provide a total output of 40 watts. An innovative aspect of the Acoustasonic 40 is that the speakers now come with whizzer cones which improve high-frequency output and response a great deal. For those who enjoy practising in quiet, or perhaps you want to plug in an audio device to play along to your favourite songs? The headphone output and AUX input enable you to do this whenever you wish. Enhance your whole timbre using the quality onboard 3-Band Equaliser controls which can be used for both channels. A Digital hall reverb function with level control allows you to transform your standard acoustic tone to that of a church hall, resonant and full-bodied. The Fender Acoustasonic 40 Amp comes in five-ply hardwood for a polished look. However, despite its time-honoured style and appearance, the sound produced by the Acoustasonic 40 is a room-filling delight and is ideal as a "grab-and-go" for any musician. Controls 3-Band EQ for each channel, digital hall reverb, volume control.